Whenever direct action strikes up a catchy tune, it won't be long before the flip side starts trying to drown it out. The siren of direct repression always begins its contrary wail. 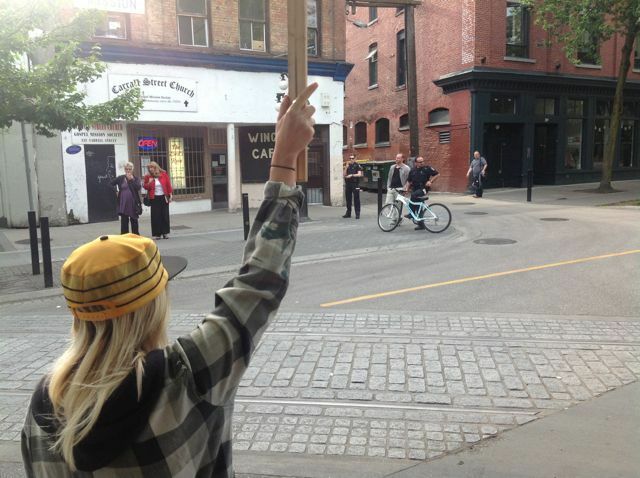 Post-Olympics Vancouver in 2013 has endured a cacophony of vituperation against anti-gentrification picketers. Extensive mainstream media coverage has weighed in heavily on the side of start-up business owners in the Downtown Eastside, "revitalization" developers, and politician-planner takeout initiatives. A flood of guff destroys its own credibility as anything more than a shrill shill chorus to accompany gentrification stomping. The only counterexample story that comes to mind is Globe and Mail coverage of Mike Harcourt's mild refusal to condemn the picketing . It's hard to guess how many tens of thousands of dollars the City of Vancouver has spent on policing in the past six months — policing designed to intimidate picketing and to back up profiteer gentrifiers. Policing has been as one-sided as mainstream media coverage. Almost no assailant of a picket has been taken to task, while picketers have suffered direct personal threats, stalking, shoving, unwanted touching, and being spat at. By far the worst incident so far: a bear spray attack  at the very beginning of a picket. Police vanished for most of the remainder of that evening, all while an expressed threat of a repeat attack continued to loom large. 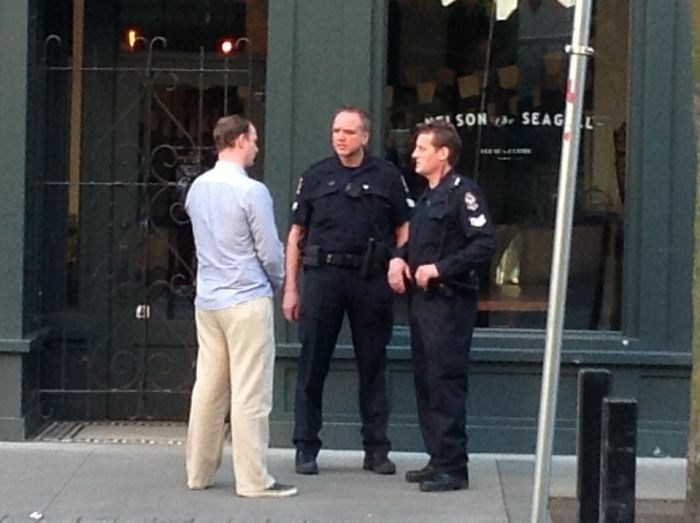 Early on, one abusive Pidgin customer made the mistake of shoving a cop, and spent a few minutes in handcuffs on the sidewalk before being allowed to walk away. No charges ever attached to that perp, nor to a visibly intoxicated driver who stopped by to indulge in harassment. On 19 July 2013, at the second-front picket launched at Cuchillo, a police officer maundered on about how "peacefulness" needed to inhibit free speech , and then stood aside for the remainder of the picket to observe the ineffectiveness of his intimidation. Mainstream media and crass critics have frothed at opportunities to smear visible and peaceful protesters. With no evidence at all, a variety of other discrete actions said to be directed at East Vancouver gentrification were lumped into one gooey doughball of disparagement: removal of a signboard from Save-On-Meats; window-smashing at Famoso Pizzeria on Commercial Drive; burning of condos under construction near East 1st Avenue and Victoria Drive. Two of these actions resulted in property damage ranging into tens and perhaps hundreds of thousands of dollars. Impotent police have failed to make arrests in these cases. Like a deranged bully, the police then turn to what they can lay hands on, and beat up on that instead. That kind of misdirection should make the cops look ridiculous, and would do so if media reporting amounted to anything more than comprador complicity. 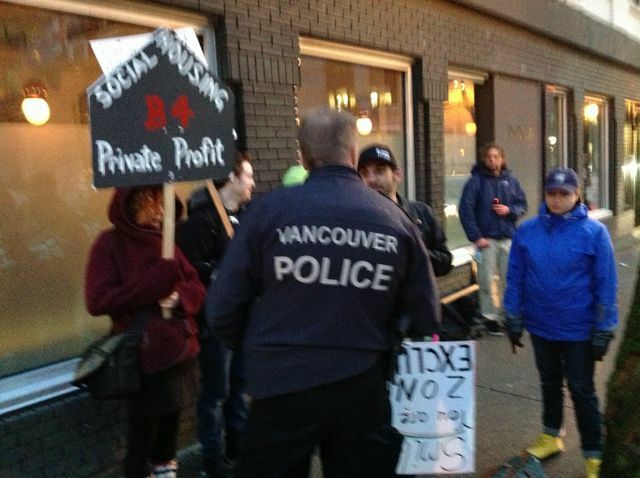 Police officers seized a protest sign, and explicitly claimed authority to do so under the infamous Vancouver bylaw aimed at structures on streets for political expression. At the time, police refused to issue a requested ticket for infraction of the dubious bylaw. An open letter challenged the confiscation , and then the Georgia Straight reported on the story . Fairly soon after that, police invited picketers to pick up the sign at their depot. Picketers insisted that the sign be delivered to the Spartacus bookstore as requested in the letter, and police complied. The hot potato popped out of custody. The fate of The People's Pickle  has been less happy. A papier-mache dill pickle mascot, cradled in its magenta scarf by many a picketer through many an evening, has been incarcerated since its 29 May 2013 seizure by Pidgin owner Brandon Grossutti. Police have worked with Grossutti to entangle the icon as "evidence" in a prosecution. The Vancouver Police Department unleashed a press conference on 17 April 2013. Their centerpiece was a promise to make an arrest in connection with the Pidgin picket. A full transcript exposes the hilarity of their oppression circus . 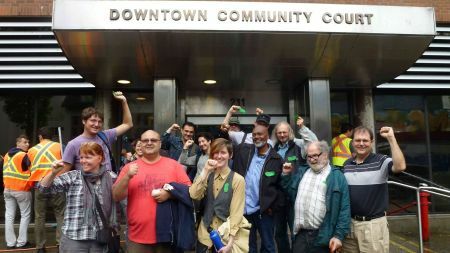 Strong immediate response included a letter from Pivot Legal and a supersized picket that numbered around sixty persons . The ballyhooed warning letter resulted in little delivery and less traction. A few weeks later a police officer walked around the crowd of pickets, offering a copy of the letter to whoever would accept one voluntarily. A final attempt to ditch a press overrun before recycling? The prospective Pidgin picket arrestee, teasingly left unnamed at the April press conference, went unapprehended for weeks. In the interim, on 3 May 2013, frustrated police released further information, to be duly parroted by mainstream media. 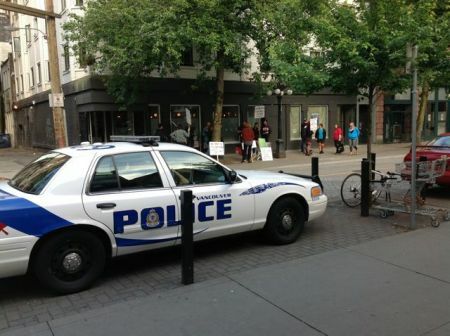 The Vancouver Sun sub-head proclaimed: "Police ask public for help in search for woman observed trying to chain doors" . On 13 May 2013 police finally succeeded in making the arrest. Robin Pickell — main occasion of a press conference, object of lengthy "manhunt" — was reported to be sought for an ill-defined "attempt" to place a lock on the front door of Pidgin. What would have been the impact of recounting this act of purported mischief at the time of the press conference? (In effect: the state wanted to prosecute a thought-crime, a presumed intent that never became an effected act.) The subsequent working out of the story appears to have received no media coverage at all. Pickell had no previous record. The case went to diversion. On 18 July 2013 a judge confirmed that all requirements were satisfied and that no criminal existed. What an anti-climax to the fervor whipped up at the press conference three months earlier! Meanwhile, to trump the preposterous witchhunt for Pickell, on 3 June 2013 police arrested picketer Kim Hearty on the basis of three separate allegations: mischief, theft, assault. Actual charges settled down to theft (of a door-prop bucket of glucose) and assault (a physical encounter, notable for the size disparity between Hearty and chunky amateur boxer Grossutti). The collaboration of Grossutti in pressing these charges testifies to how phony his projected veneer of genial generosity really is. A decent account of the incident that led to Hearty's arrest  will not be found in mainstream media. What a surprise. After four appearances in community court, each time with a crowd of supporters in attendance, Hearty on 31 July 2013 entered a plea of not guilty, and now anticipates a trial date in December 2013. Two women, both aged 25, have been singled out for judicial harassment by "criminal" charges on the flimsiest of pretexts. One has chosen to get done with the state as rapidly and as simply as possible, rather than endure the protracted uncertainties and greater expense of standing trial. The other must suffer many months of being jerked around by her unwanted role in an obvious farce. Through these two, all other picketers are being sent a chilling reminder that "the law" has little to do with common sense or magnitude of transgression. Meanwhile, gentrifiers and their posse gather to whine about "bullies" at a press conference. The pot wants to create a distraction by dissing the kettle. The kettle just keeps on simmering.